The new CNN set up from the reporters' perspective. CNN has joined some of the other major television networks covering the White House in upgrading its equipment to be a bit more environmentally friendly. Located on a raised platform along the west edge of the North Lawn are a row of television cameras and stalls where reporters go on TV with the White House in the background. 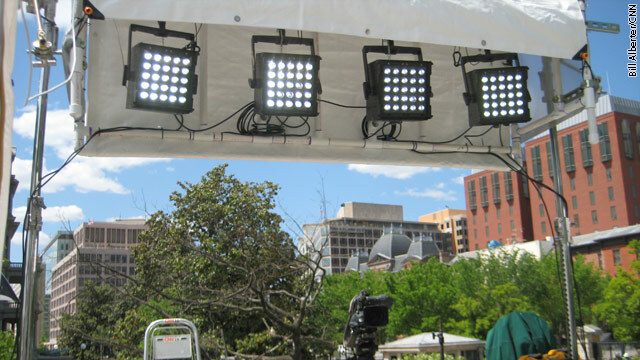 CNN recently installed new Nila brand LED lighting instruments at its location to help illuminate on-air talent when they’re live from the White House North Lawn. The new lights are bright enough while drawing far less energy than the old HMI (Hydrargyrum medium-arc iodide) lights that were used at the White House for over 20 years. So next time you see Jessica Yellin, Dan Lothian or Briana Keilar live from the White House you'll now know what they're looking at. What a joke of an article. The incremental difference in power consumption of an HMI to an LED is grossly overstated and the amount of time those lights are actually on and the cost difference makes the payback period too long to be a cost effective end-use which is the balance with which this country must stay cognitive. Oh!! Really!! No complaints?? If not, this is a first!! LOL! I have a complaint – how come there are no dollar figures in this article? Also, have to like the line "the new lights are bright enough". Maybe CNN and the other television networks feel it is none of your business what they paid to upgrade their lighting for television coverage at the White House. i think the fact they are taking the environment into consideration by spending extra funds to upgrade to a greener product (LED) that will cut their fuel consumption while providing better lighting is great. Way to go CNN! Besides Michele Bachmann will be so bummed that they didn't use 1950's incandescent bulbs. This has got to be an all around plus...plus..win...win. listen obama is a phony...you have to be an idiot to believe anything he does is for the good of anyone/thing but him...a true narcissist. @John...LOL! !...Yep...I was wondering where you were. I knew you were out there somewhere 'bending over backwards' to come up with a complaint! That's what you do! LOL! The idea about this Whitehouse energy upgrade is obviously being paid for now, to insure lower energy costs in the future. Most intelligent people understand this effort with no complaints and no questions asked!! Oh...but not you!! There is allways a problem with any and everything this Whitehouse does,...politically, professionally, diplomatically, socially, and even personally. If Barack Obama personally found the cure for cancer, you'd find a problem with that! 'He took too long,...all of these people who have already died of this deadly disease, and he's just now finding a cure?? 'The blood of those victims is on his hands'! 'He's a failure and he should be held accountable'!! 'Where are the 'dollar figures' of the cost of his research to find the cure anyway?? 'It was paid for by taxpayer money'!!! LOL!! You beat all John! As far as Liberals asking for it....we usually don't have to ask for it,....you Conservatives just keep throwing your divisive BS up against the Liberal wall, hoping some of it will stick. Choose your battles John,...all of them aren't yours!! You certainly won't win them all! Thanks Jean,....good comment. I agree. Btw John,...I don't remember you Cons asking Bush for a 'dollar figure' on any of the 'failed policies' he pushed us threw! We all found out what it was after the fact,..and are trying to get those 'figures' paid off right now! But you did ask now you are complaining – just like I said you would. Obama is not a doctor. I would not expect him to find a cure for cancer. He is the leader of a nation, even though he blames everyone else for things that do not go his way. IMO, people who follow blindly and do not question things are very ignorant, especially when it related to people who work for them. For your information – I am the first to give credit where credit is due like I did last week when the president had wounded veterans at the WH. I was the first to post a comment and the comment read "good job BO". I have also critized Bush many many times in the past for his poor performance. But I realize Bush hasn't been in office for 3.4 years (unlike people like you). But, as poor as Bush was as a president I really think BO is much worse for this country and all working Americans. I have to admit, BO is very good at comedy, a good celeb and he seems like a nice guy. Make up what you want, and I know you will, but if you call people out expect something in return. BTW, gotta love these libs who ask for it then complain when people who disagree respond. really means TRILLIONS of hard earned tax payer green backs are going down the tubes, thanks to Obama's irresponsible spending. More fluff stories from CNN. What about all the money Obama wastes? how much fuel does the obamas use flying al over the world on vacations and campaigning....and what about Pannetta's $32,000.00 tax payer funded trips to his home in california....how much fuel there? Green eh? From The-fraud-in-chief's administration. ... AND DON'T FORGET THE MILLIONS, AND MILLIONS, IN TAX DOLLARS OBAMA IS SQUANDERING ON HIS REELECTION CAMPAIGN. I CAN'T WAIT TIL THIS TRAITOR, LIAR, AND THIEF, IS KICKED OUT OF THE WHITE HOUSE IN NOVEMBER ... GOOD RIDDANCE !!! OBAMA 2012. BECAUSE HE CARES FOR THE ENVIRONMENT, AMERICAN INNOVATION, AND BECAUSE IT WILL PISS OFF THE FAR RIGHT EXTREMIST PIGS.